When we first coined the term Robotic Process Automation (RPA) over a decade ago, we quickly realized how valuable and transformative this technology would be for all enterprises. Today, the RPA market is red hot with we’re seeing more competition gunning for Blue Prism. We welcome the competition but as this market continues to rapidly evolve, important facts can often get overlooked. Since 2001, we’ve continued to refine our Blue Prism Digital Workforce with the help of our partners and vocal customers that include leading Fortune 500 companies across the world. We’ve built an actual “digital worker” that can meet the rigors of highly regulated industries, including finance, insurance, utilities, telecom, healthcare, retail and manufacturing. At last count we were in +40 vertical industries — a global phenomenon if I’ve ever seen one. As our CEO and co-founder, Alastair Bathgate eloquently put it in this video, we’ve taken the concept of a software robot or digital worker and given it industrial scale, enterprise grade capabilities including scalability, security, governance and compliance. For more than a decade, we’ve remain focused on delivering blue chip customers digital transformations via our RPA offering. Blue Prism more than doubled its revenues in FY2017 while securing £70M (approx. $100M US) via placing in public markets. These funds are already being used to accelerate the company’s sales and marketing activities across the globe. What’s important to note is that Blue Prism is the only publicly traded pure play RPA vendor. We offer complete financial transparency. In 2017, we secured more than 600 new software deals, including 324 enterprise-level deployments in the United States, Europe, Asia Pacific, Latin America, Australia and New Zealand. Speaking of customers, we’ve amassed some incredible ones along the way, including AIG, Allstate Insurance, Bechtel, Boeing, Coca Cola, DeNA, DTE Energy, Ericsson, Fannie Mae, Honda Motor Company, Kaiser Permanente, KBL Bank, Maybank, National Grid, Schroders, Sony Pictures, United Utilities and Walgreens. We are also the industry’s first and only RPA vendor to offer certified reference architectures for Microsoft Azure and Amazon Web Services. Customers are seeing the benefits of our partnerships and alliances with Microsoft, Amazon, Google, and IBM with successful in-cloud deployments. Blue Prism finished 2017 with the highest customer satisfaction rating of 96 percent in an independent customer survey by Knowledge Capital Partners (to download report click here). The survey of global Blue Prism customers highlighted satisfaction for platform adaptability, scalability, security and employee satisfaction as some of the most outstanding results in their multi-month investigation. In 2017, Blue Prism was named one of MIT Tech Review’s 50 Smartest Companies, as well as being the winner of the 2017 UK Tech awards. 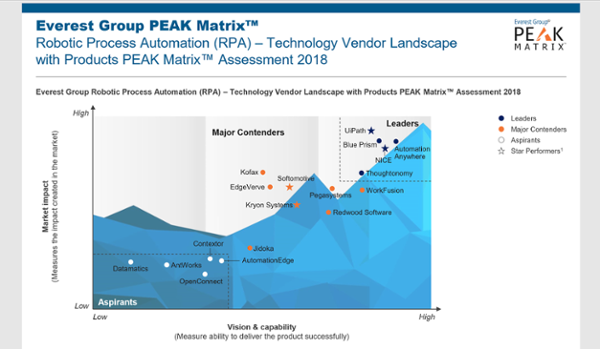 The company was also acknowledged by Everest Research as an RPA market leader in their PEAK Matrix Assessment report in 2018. Although the need for automation is growing, these are still early days for the RPA market. We are proud of the work our team has completed and the valuable, truly innovative, product offering that we’ve developed. Having a product isn’t enough however, as our list of valuable blue chip clients and partners continues to grow every day – something that we’re both grateful for and proud of. We’ve built something truly unique at Blue Prism, a completely autonomous digital worker that can both improve the capability of businesses and allow existing employees to grow their capabilities, attain real satisfaction in their jobs and as a result focus on collaboration and innovation. Even after setting the pace for the RPA industry seventeen years ago, we continue to develop and iterate on what our Digital Workforce is and how it can improve the lives of humans. That said, if the past is any indicator, then the best is yet to come.